Finally, something is being done about the stench coming from Albany, and we’re not talking about the recent indictments of Gov. Andrew Cuomo’s top aides. Six years after Cuomo and his NYS Parks commissioner Rose Harvey came into office, 54 large capacity cesspools (LCCs) containing human filth, among 16 New York state parks, with the potential to leach into the water table in violation of the federal Safe Drinking Water Act (SWDA), are finally slated to be closed, pursuant to a consent judgment rendered in federal court last month. Regulations promulgated by the U.S. Environmental Protection Agency, in accordance with the SWDA, banned construction of new LCCs nationwide as of April, 2000, and required owners or operators of all LCCs to close them by April, 2005, but the quick succession of administrations after Gov. George Pataki departed in December, 2006 left the task to Cuomo and Harvey, who essentially ignored the issue except for waging a legal battle against EPA’s enforcement efforts, risking a severe threat to human health for over half a decade. Under the agreement between State Parks and the EPA, many of the raw sewage-containing cesspools in the parks won’t be closed until 2019, a full fourteen years after they were outlawed. In addition to nitrogen, untreated sewage has the potential to contaminate drinking water with bacteria (salmonellosis, shigellosis, typhoid and cholera), viruses (hepatitis) and parasites (threadworm, hookworm and dwarf tapeworm). 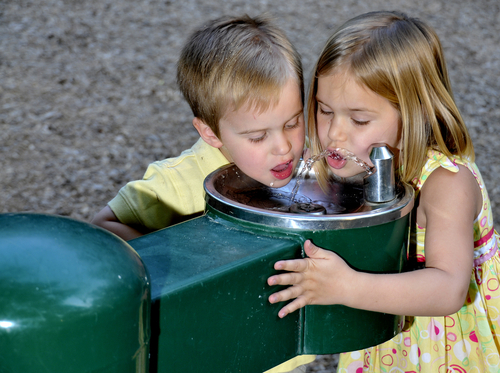 If you visit any New York State Parks between now and 2019, you may want to think twice about letting your kids use the drinking fountains. State Parks closes the restrooms at Devil’s Hole and Whirlpool State Parks, as this newspaper has reported on for years, from November through mid-April, to the great inconvenience of the many local residents who enjoy hiking and exploring the Niagara Gorge during the winter. Sunken Meadow State Park, on the other hand, in Suffolk County on the tony north shore of Long Island, gets to have “Year Round Bathrooms”. Cuomo’s State Parks, or rather, the taxpayers of New York State, are on the hook to pay a $150,000 fine to the feds for the violations, and will spend an estimated $9 million to fix the problem, $1 million of which will be used to mitigate the effects of toxic algae blooms that have sprouted in Long Island’s waterways as a result of the nitrogen-leaking cesspools, although State Parks officially denies that human waste from any of its cesspools has infiltrated drinking water supplies. The feds are no dummies, and they cut off certain avenues the wily Cuomo may have taken to shirk responsibility for this deplorable situation. Translation: the putrid mess is to remain on our, the taxpayers’, lap, to clean up. Why did it take so long for Cuomo and his State Parks agency to come into compliance with regards to this clear danger to public health?